Begin your rental any day of the week! Please inquire. 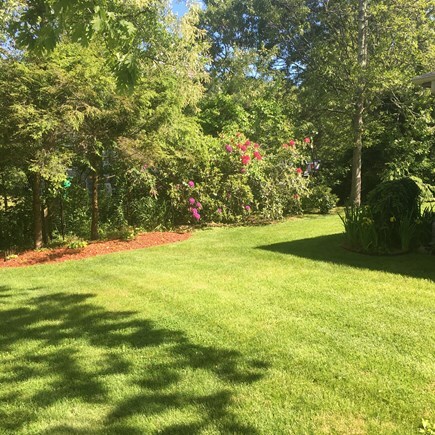 Beautiful country home just down the road from Morning Glory Farm, this lovely updated house is set back off the main road to allow you plenty of privacy. 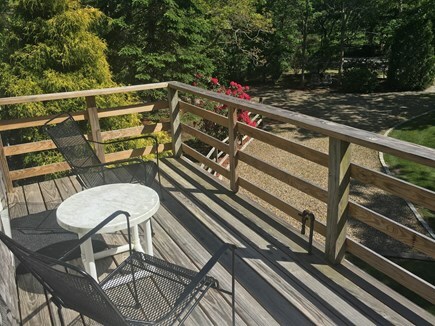 It's surrounded by an expansive yard, lovely landscaping, and a beautiful, new farmers deck complete with comfy deck furniture for all who stay to enjoy. 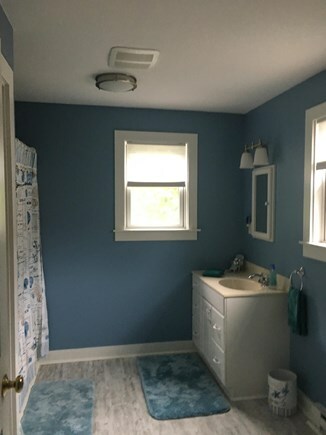 The 3 bedroom 2 1/2 bath home is big enough and comfortable enough to accommodate up to 8 guests, but NO Pets. 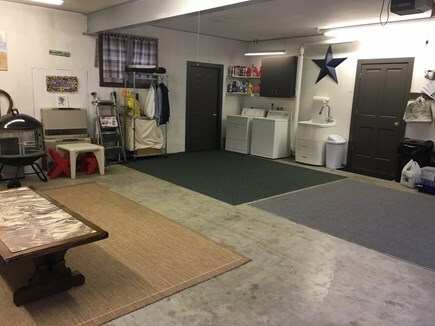 The oversized garage is large enough for kids to play in and includes a washer, dryer and laundry sink. 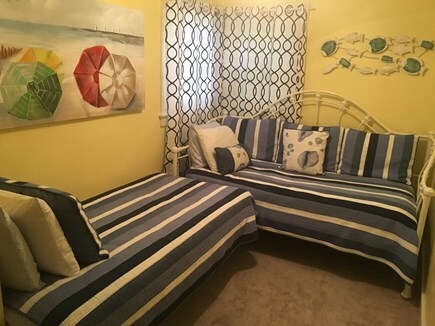 The newly renovated attached carriage house apartment has one large bedroom, a full bathroom, and a roomy living room with both a day bed and a sleep sofa. 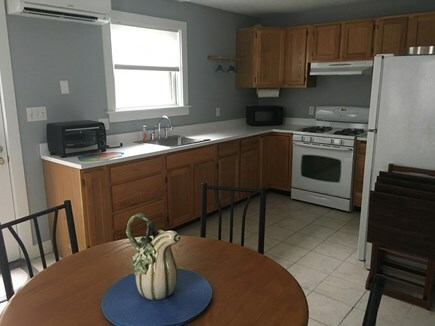 The full kitchen in the main house boasts a separate dining area for 4 people, its own washer and dryer, and a private deck. 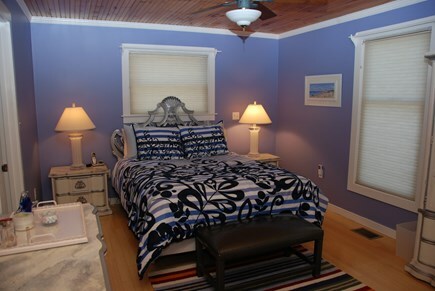 Both upstairs and downstairs are fully air conditioned, in addition to each room having its own ceiling fan. A large TV, together with DVD and VCR, are located in each living area, and free WIFI is included. 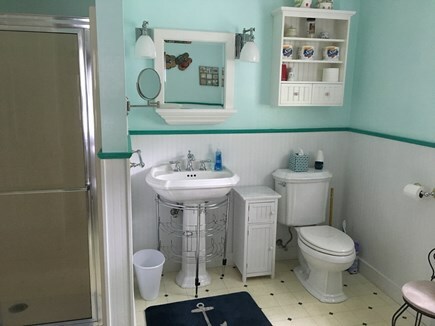 This property also includes a very private outdoor shower, a gas BBQ grill, lobster and clam pots, and beach chairs for your vacation enjoyment at our beautiful island paradise. Additional availability info: rental periods vary, please contact us. Additional pricing info: Cleaning Fee $200 per week plus $1000 secuirty deposit, State and local taxes of 9.7% will apply. We had the most spectacular stay at this property. 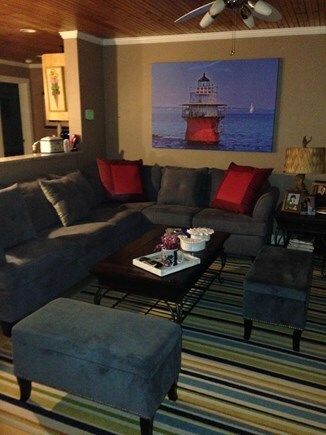 The owners were a delight to work with and had recently updated the upstairs area of the house. We came with our 2 school aged boys and another family with 2 kids as well. The layout of the house was perfect as the apartment area upstairs allowed each family to have their privacy, but there was also ample space in the main house living room or peaceful wrap around porch for the families to congregate together. 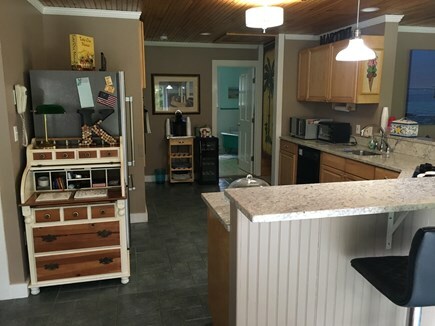 The owners have thought of every detail - ample kitchenware for home cooks, lots of seating on the porch which overlooks the well-manicured yard and farm lands, and access to beach chairs, a wood burning fire pit for late night s’mores, and even some games for the kids for a rainy day. We enjoyed a wonderful stay at this property. It was our second stay. 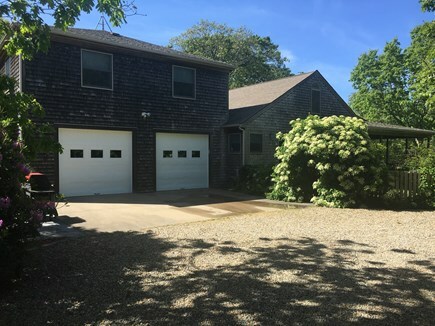 The property is beautifully maintained and is in a great location close to Edgartown with bike riding and walking trails situated close to the property. It is conveniently located near Morning Glory Farm where you can find fresh coffee and breakfast selections. The home itself is well maintained and pleasingly furnished. First time on the Vineyard. Loved South Beach! The house is very comfortable and well laid out. Saw a hummingbird in the back yard!! It was our first time here, but we enjoyed very much, the house and other towns, the beach, exploring other towns, food was amazing. Gladly will be back. We loved staying in your home. Our two boys loved the back yard and wagon rides to Morning Glory. The outdoor shower was tranquil. Great memories have been created. Thank you for letting us stay in your home. We loved enjoying our coffee on the porch as the sun rose. The outdoor shower is the BEST! Perfect week in a perfect home! 1. Location: every morning I would walk to Morning Glory Farm for coffee and fresh baked muffin. It is literally a two minute walk. 2. Location Point #2: It is one mile to Edgartown center, so one night we walked to dinner so we didn't have to drive. It's just a straight road into town. Thank you for a wonderful home to spend our family vacation! We loved the carriage house and the grandkids grounds loved the main house. Everything was in great working order- comfy, cozy and relaxing. We will be back – it was the ideal setup for our family. Thank you so much for the use of your house – it was perfect for us. We especially loved your beautiful back yard and deck. Thank you for being so accommodating. My husband and I are the proud owners of our wonderful home on the Vineyard. We purchased this home in 2010 and it was one of the best things we have ever done. It's our home away from home and we love sharing it with all the people who choose to rent and stay in our piece of heaven. It is quiet and tranquil, yet close to everything to keep life interesting. Not only do we love it, but our two daughters and their families love it as well. Our 4 grandchildren are the happiest when we are all together sharing happy moments and making memories. Our home is centrally located. 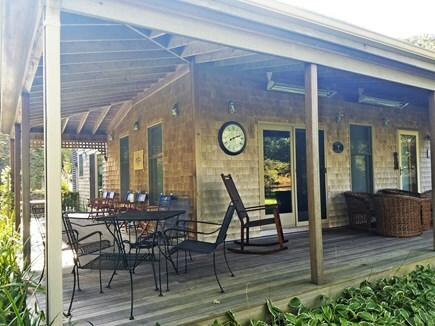 We are 2 1/2 miles from south beach, 1 mile from downtown Edgartown and a stones throw to Morning Glory Farms. Being able to walk to the farm daily and partake of their delicious home-made muffins, pies and breads and yummy coffee truly makes starting your day great! The short picturesque walk down the bike path to main street in Edgartown is a joy. One of many horse farms is along this road which adds to the beauty of your walk. Along your walk into town you will pass the brand new Edgartown Library which holds many events for adults and children alike. There is so much special about Edgartown, not quite sure where to begin. There are restaurants galore, one more yummy then the next. If shopping is what you desire, Edgartown certainly has what to offer. From clothing stores and shoe stores to gift stores and jewelry stores. It certainly has something for everyone, including one of the best movie theatres on the island. This is where my husband and I catch up on all the best and latest movies we never get to see. There are art galleries and museums for your viewing pleasure, and, of course, the old Whaling Church, which houses some wonderful concerts for your enjoyment.